But why take a 5700 mAh cell (measured at 0.2C, 5900 with lower rate) and mark it as 5500 mAh? Why take a 55A cell and say it’s 5000 mAh? The only thing that comes to my mind is that they wanted to leave themselves some space to downgrade the cell and still meet their own specs. Do I think that’s the real reason? No, I simply don’t know. Agro, for me there's no good reason to downgrade a product, this is a looking for trouble attitude. Effort must be put in an industrial product for it to meet its specs within tight margin the entirety of its life. Batteries aren't toys, and for a wrap I strictly prefer to stick to actual manufacturer specifications no matter how good or wrong they may look, it's their standards. In fact I prefer the OEM's wrap. PLB usually rates capacity at 1C rate in their charts. By the way, look at this sweet sale (not for overseas, kills the Free Shipping deal): https://www.aliexpress.com/item/Liitokala-2PCS-26650-rechargeable-battery-26650A-lithium-battery-3-7V-5100mA-26650-50A-blue-Suitable-for/1000004139007.html Rock bottom price and up to 6 pieces! Originally posted on Thu, 01/04/2018 - 23:00. Edited to fix font size. The shockli is definitely the best of all those, at least for capacity and minimum voltage drop. Agro, for me there’s no good reason to downgrade a product, this is a looking for trouble attitude. Effort must be put in an industrial product for it to meet its specs within tight margin the entirety of its life. Batteries aren’t toys, and for a wrap I strictly prefer to stick to actual manufacturer specifications no matter how good or wrong they may look, it’s their standards. In fact I prefer the OEM’s wrap. Good find with PLB specifying @ 1C. HKJ result is still higher, but not much. I’d say it’s fully consistent with the hypothesis that he actually tested a PLB cell. You ask why downgrade? To first get good reviews then save money. While still meeting their specs. I still don’t see another explanation and still am not satisfied with this one. BTW I already have a 26650-50A and want to order something better for the UT-02 I’m waiting for. Have you measured those or seen anyone doing so? Because I would totally expect at least the Keeppowers to be exactly what HKJ tested. That’s because we haven’t seen any other cell near this capacity. Only HJK for the shockli. I haven’t seen anyone test those 6Ah keepowers, do you have any links to tests? Since the other keepower batteries have the advertised capacities then I would assume these 6Ah ones do too, so yeah that would be about the same as the shockli which has about 5.9Ah because it is underrated. However, if you compare a 5200mAh keepower vs a 5200mAh shockli on HJK’s tests you can see that the shockli has lower voltage drop under load. Until there are some concrete tests on these 6Ah keepowers I think it is safe to assume that their performance will be similar to above, with slightly more voltage drop than shockli. Tests of others? Null, nicht, nada. I don’t think there are many 5900 mAh cells on the market, so I expect KP and Shockli to be exactly the same. But that’s a guess, not more no less. For shockli 26650 5500mAh ,the minimum capacity is 5500mah on the 0.5C (0.5*5.5=2.75A) discharge current . It is our test standards . PLB's INR26650-55A cell is rated at 1C discharge (5.5A) down to 2.75V. Since cells must meet a minimum capacity rating it a wise thing is to state a slightly “underrated” average cell performance in order for even the lower performing cells to qualify. 1C rating and “long cycle life” make sense for the electric vehicle market. You can ask Shockli's Simon who's the OEM behind their “5500mAh” cell, too. Have you measured those or seen anyone doing so? Because I would totally expect at least the Keeppowers to be exactly what HKJ tested. That’s because we haven’t seen any other cell near this capacity. Only HJK for the shockli. I haven’t seen anyone test those 6Ah keepowers, do you have any links to tests? Since the other keepower batteries have the advertised capacities then I would assume these 6Ah ones do too, so yeah that would be about the same as the shockli which has about 5.9Ah because it is underrated. http://lygte-info.dk/review/batteries2012/Common26650comparator.php However, if you compare a 5200mAh keepower vs a 5200mAh shockli on HJK’s tests you can see that the shockli has lower voltage drop under load. Until there are some concrete tests on these 6Ah keepowers I think it is safe to assume that their performance will be similar to above, with slightly more voltage drop than shockli. Now I will sorting out which flashlight and e-cigarette models can fit the 26650 5500mah battery.so we can give some guidance for the BLF member when they buy. thanks very much, welcome to discuss. 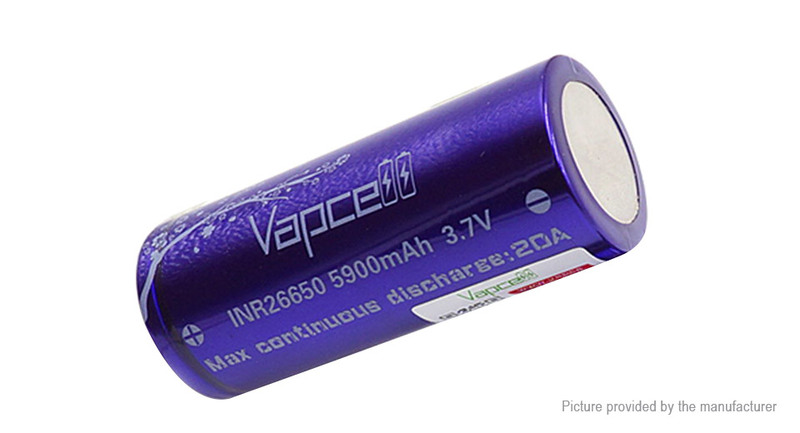 Would you share your valuable experience that which flashlight and e-cigarette models can fit the 26650 5500mah battery. Today Richard share the Convoy L6 can use the shockli 26650 5500mah battery . Yes sir. I just went over my 26650 lights with the shockli 26650 5500 mah ( button top and flat top). Conoy l6. Button top works. Convoy l2. Button top or flat top works. Convoy x3. Button top or flat top works. Olight rd50 seeker.. button top works only. Flat top is too short. Jaxman z1. Button top or flat top ok.
Lumintop odf30. Button top or flat top works. Shockli-Simon, since you know your cell is this one, sharing size and footprint with the popular LiitoKala INR26650-50A/Lii-50A, you can also benefit from users of this later cell's reports with regards to flashlight or any other gear's suitability. Olight sd26 seeker.. button top works only. Flat top is too short. Did you mean the R50 Seeker? Self screwing up themselves, an Olight classic. Greedy lads and lasses, imho. You’ve listed 7 models of flashlights. Thanks for your information. You are enthusiastic, like a flashlight in the dark, can bring light to everyone. Shockli-Simon – I don’t have much add to the Newlumen’s list. I’ll check with UT-02 once my batteries arrive. As Manker u21 works, this one should too. I discarded some measurements that seemed way off (2xxx mAh…) or not legit or I just wasn’t sure. Overall, Liitokala is all over the map. It may be that they use various cells under the wraps. Dolidada is more consistent, but it may be due to smaller sample size. Agro, there's no official reference to a 5500mAh 26650 cell in the LiitoKala chinese website. Flat top works with UTorch UT02. Your welcome.. i also got the thrunite tc20 today.. shockli flat top and button top works perfect in this light.. I just received my Shockli from Mountain Electronics and my Xtar Dragon VP4 Plus tested it at 5,948 mah. The test current is 1A. In comparison the Xtar 26650 5000mAh 3.6V Protected cell from BatteryJunction tested at 5,224 mah. Yeah, there are normal variations between batches or even individual cells and it would be bad if they sold a battery as 5900mah if half the time it doesn’t get that. Also different devices measure the capacity slightly differently, or down to different discharge voltages, or using different discharge currents, so saying 5500 is a safe bet when it can definitely do that or more. The PLB discharged the battery with 0.2C (1.1A). The 5700 – 5800mAh, therefore, is not strange to see someone with such discharges. But above, I saw battery measurements with Opus. The measurements, however, were during charging. Opus during charging measures the total current flowing from the circuit. For the result to be right, it should be subtracted ± 300mAh. The most accurate measurement to look at battery capacity should be made by discharging. Hi, I bought these batteries Shockli 26650 5500mAh (top button) a few days ago and I tested them on my 3600 lumen (each) underwater torches. Preaviously I had “common” batteries that didn’t run the cree led (3x XM-L2) at maximum capability; now the difference is clear. I am very happy for the results and I can confirm the very good drainage capacity. These is a real high current cell with very good capacity! Many thanks to Simon (Marketing Director) for availability and professionalism shown! Received my Shockli IMR 5500 FLAT top after about 3 or 4 weeks (to arrive in Italy from China). They were perfectly boxed, with a double battery case and two little magnets to use them in series! I tried them on my TC20 and worked greatly, now I’m waiting the Acebeam EC50 gen III to be back in stock and try them with it (Acebeam original 26650 battery is not good enough for a 1500 lm or more flashlight..). Where are you order ? Link please. I ordered directly from Simon, you can write him here on BLF in PM or via customer care of Shockli official page.